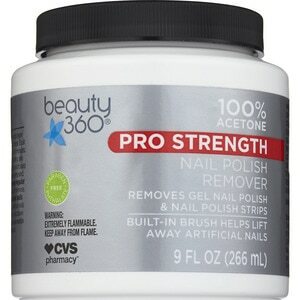 Beauty 360 100% Acetone Nail Polish Remover is a maximum strength formula of acetone, the same ingredient used by professional manicurists and salons. It works on natural nails to quickly and effectively remove gel and glitter polish, as well as nail polish strips. The built-in brush helps lift away artificial nails. To remove gel polish and nail polish strips: File the top layer of polish with a medium-coarse file to scuff surface for easier removal. Soak entire nail (not entire hand) in the polish remover for 10-15 minutes. Gently scrape away polish from the nail and surrounding skin with a wood cuticle pusher. Repeat if needed until all nail polish has been removed. After using, wash hands to remove any remaining acetone. Lightly buff nails until all residue has been removed. Apply nail oil and/or hand lotion to restore moisture. To remove nail polish: Insert finger into sponge, twist and remove. Wash hands thoroughly after use. To remove artificial nails and tips: Soak in nail polish remover to dissolve artificial nails for easy removal. You may need to file any additional residue and clean nail surface before applying any new nail products. Not For polish removal on artificial nails. WARNING: Extremely flammable. Liquid and vapors may ignite. Do not use when smoking. Do not use or store near fire, flame or heat. Keep out of eyes. In case of eye contact, immediately flush eyes with water, remove any contact lenses and continue to flush eyes with plenty of water for at least 15 minutes. Contact physician. Harmful if ingested. In case of accidental ingestion, give fluids liberally and consult with local Poison Control Center. Harmful to synthetic fabrics, wood finishes and plastics. KEEP OUT OF REACH OF CHILDREN. TIGHTEN LID WHEN NOT IN USE.